This photo received an honorable mention in the International Photography Awards 2018. 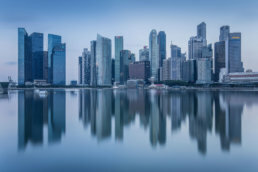 The Singapore skyline at Marina Bay before sunrise, on a calm July morning in 2016. I always find peace in the tranquillity of early morning reflections – a moment to enjoy the silence as the city awakens. I took this long exposure with an neutral density filter to make the calm water look extra smooth.